Comes with 201T-F 3-in-1 Combination pH electrode, flexible electrode holder, and RS232 software. ACCURATE MEASUREMENT: Accuracy: ±0.01 pH, Range: -2.00-19.99 pH, ATC, Auto Calibration with buffer recognition. Adopts advanced digital filtering technology, improving response time and accuracy. 3 measurement modes: stable measurement display mode, timing measuring mode, and continuous measuring mode. Data Processing: GLP standard data management, 600 data sets of storage, manual/auto timing storage, RS232 data output. RELIABLE Structure Design: Large LCD screen with blue backlit, Meets IP54 waterproof and dustproof. What's in the box: MP511 benchtop pH Meter, 201T-F 3-in-1 combination pH Electrode, 602 Flexible Electrode Holder, pH calibration solutions (4.00, 7.00, 10.01), power adaptor, RS232 cable, software disk, and a manual. 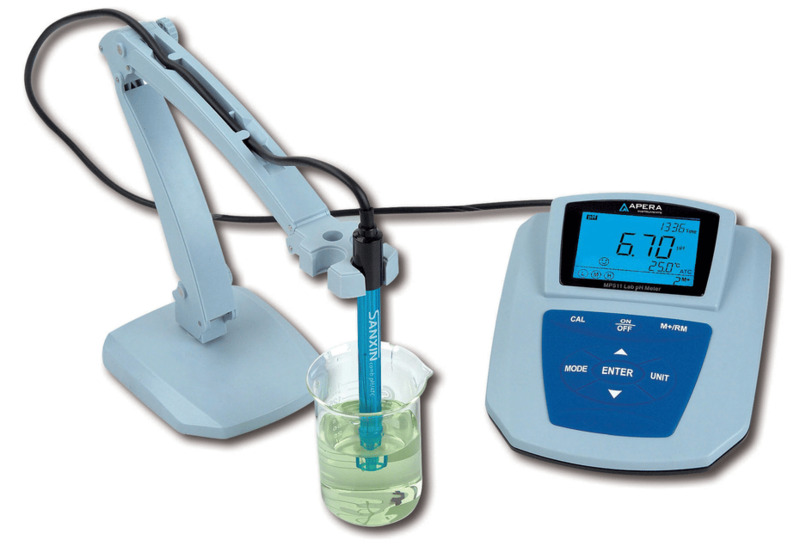 Our MP511 Benchtop pH Meter is a prime example ofthe Affordable Accuracy that we provide our customers. It is the mostcost-effective laboratory benchtop pH meter of the 4th generation, providing AccurateMeasurement, Quick Response, and Consistent Result thanks to the advanceddigital filtering technology and high quality 3-in-1 combination pH electrode.It has three measuring modes for your specific measuring needs: stablemeasurement display mode, timing measuring mode, and continuous measuring mode. The MP511 Benchtop pH Meter also comes with intelligent functions:Auto Calibration with auto buffer recognition, Auto Temperature Compensation,Time/Date display, easy parameter setup, and self-diagnostic information. Thereis a GLP standard data management, 600 data sets of storage, manual/auto timingstorage, and RS232 data output. Along with the functions comes a ReliableStructure Design: Large LCD screen with blue backlit, and all connectors areprotected by silicon caps. The instrument is durable with an IP54 waterproofand dustproof rating. The meter is CE certified and comes with a 2-YEARWarranty (6 months for the probe).